In the last few days we’ve seen videos of angry confrontations on airliners. Throughout the country there are angry demonstrations about many things. Whether you drive on the Beltway or a downtown thoroughfare, someone is likely to blow their horn at you or cut you off or maybe shout at you. The Internet, especially the social media, is filled with angry, disparaging comments, comments that often ruin the reputations, even the lives of others. Perhaps in the last few weeks or months you have witnessed an angry confrontation in the workplace or a social setting. How can we miss the anger that infects not only our politics but also endangers the very peace of the world itself? Yes, there’s a lot of public anger in the media, on the Internet, in the streets, in the workplace, and among the nations. But public anger, alas, is not the whole story. There is also the private anger that is so easily harbored in our hearts – anger against family members, co-workers, enemies, even our friends. Anger and disappointment over the unfairness of life, over missed or denied opportunities, even anger and disappointment with oneself. How many people harbor grudges throughout their entire lives and even take these grudges and resentments to the grave. When we harbor angry thoughts or behave in an angry way, we may think that our anger is an isolated part of our life – that it is not so bad because in every other way we try to be good. In fact, anger is one of the devil’s prime tools for working on us. When we’re angry, the devil can get us to do a lot of bad things. He can tempt us to doubt the goodness of God. He can make us fearful. He can make us feel sorry for ourselves so that we will pander to our lower nature. What a contrast between the anger that is so much a part of our daily experience and the scene in the Upper Room where the disciples encounter the Risen Lord. Even as the Apostles feared for their lives and struggled with unbelief, Jesus greeted them with these words, “Peace be with you” . . . and then he showed them his wounded hands and side, repeating, “Peace be with you!” Jesus’s greeting was not a mere wish. By dying on the Cross and rising from the dead Jesus defeated sin and death. He had made “peace by the blood of his Cross” (Col. 1:20). He had opened the way for humanity to be at peace with God and for human beings to live in peace and harmony with one another. In that amazing encounter, Jesus granted his peace not only to the Apostles but also to us. For Jesus breathed on Apostles, thus giving them the Holy Spirit, and, as a result, they were empower to continue Jesus’ work of forgiving sins: “Whose sins you forgive are forgiven them and whose sins you retain are retained.” With these words, Jesus instituted the Sacrament of Reconciliation, the Sacrament of Mercy, in which we find the forgiveness of our sins. Even though Jesus did this once-for-all, we need to be reminded of God’s mercy. As we go about living in a world that is often consumed by its own anger, we can so easily forget about the availability of God’s mercy and our need for it. For that reason, God has sent us a messenger of mercy, St. Faustina Kowalska. She was born into poverty and came of age in what was a most violent century. She entered religious life, the Congregation of the Sisters of Divine Mercy. Because she was poorly educated, her tasks in the convent were simple yet it was she whom the Lord chose as the modern-day Apostle of Mercy. Her religious name, “Faustina” means “fortunate” and how blessed we are that the Lord gave us this messenger of mercy! For not unlike the Apostles in the Upper Room, Sister Faustina mystically encountered the Risen Lord and beheld afresh the blood and water flowing from his wounded side, the water in which we are baptized, the blood by which we are redeemed. It was given to her to see the enormity, the destructive power of sin and the still greater immensity of God’s mercy, for those who are willing to accept it. 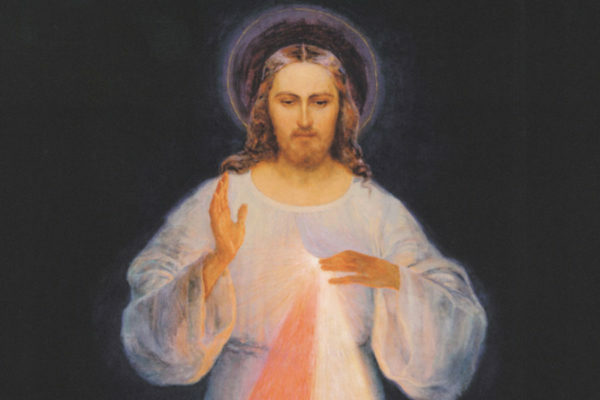 In our times, St. Faustina has taught us to put our trust in this mercy – to put our trust in the Person of the Risen Lord – Jesus, I trust in Thee! In her diary St. Faustina wrote: “God is very generous and does not deny his grace to anyone. Indeed he gives more than what we ask of him.” Dear friends, if only we deeply believed in the generosity of God’s mercy. If only we would allow ourselves to encounter the Risen Lord and to experience the abundant power of his mercy by frequently confessing our sins in the Sacrament of Reconciliation. For the mercy won for us by the Risen Lord does not fade or fail. 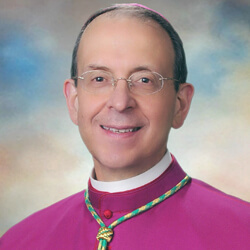 No, as Psalm 118 proclaims, “His mercy endures forever!” And, as St. Peter teaches us in today’s second reading, the God “in his great mercy gave us a new birth to a living hope through the resurrection of Jesus Christ from the dead…” This new birth, first given us in Baptism, is revived and strengthened every time we make good and worthy use of the Sacrament of Penance, convinced in faith of the power of the Risen Lord over sin and death. When we examine our consciences before God, let us perceive, as did St. Faustina, that no sin is trivial, no sin should go unconfessed or unforgiven. What’s more, as we ask for the grace to see our souls as God sees them, then our focus is shifted from our anger against others to our own need for mercy. Then, when we confess our sins and receive absolution from the priest, our sins are forgiven and we experience the strength and beauty of God’s mercy. Often, as we leave the confessional the priest will say to us, “Go in peace!” and indeed, once we have received the mercy of God, we must become ourselves messengers of peace in an angry world. And what a difference it makes to let God’s peace, his mercy rule our hearts. In the first reading from the Acts of the Apostles, we read of the harmony, the peace, the generosity, and the prayerfulness of that early Christian community. Instead of being selfish and angry, they shared what they had with one another. Instead of ignoring God, they gathered frequently for the Eucharist. Instead of condemning one another, they spent their time praising God and winning over many converts to Christianity – to the new way of life given to them by the Risen Lord. St. Faustina once said, “Help me, O Lord, that my hands may be merciful and filled with good deeds, so that I may do only good to my neighbors.” Let us, then, on this Divine Mercy Sunday, resolve in the power of the Holy Spirit, to open our hearts ever more widely to God’s mercy and forgiveness and then, as individuals and as parish communities, let us also be witnesses to the peace of the Risen Lord by surrendering our anger and indeed all our sins, and proclaiming instead the praises of the God of mercy by all we say and do. And may the peace of the Risen Lord be with you always!